PORT CHARLOTTE, Fla. -- All lanes of Tamiami Trail are now open after a deadly crash left two Port Charlotte residents dead early Monday. Our Breaking News Tracker was at the scene near Adams Court, between Elkcam Boulevard and Harbor Boulevard, shortly after the crash happened around 2:30 a.m. According to Florida Highway Patrol, a car was headed northbound when for unknown reasons it ran off the roadway into a drainage ditch. The car then went airborne and hit a street sign and a tree before coming to a stop in the parking lot of an animal clinic. 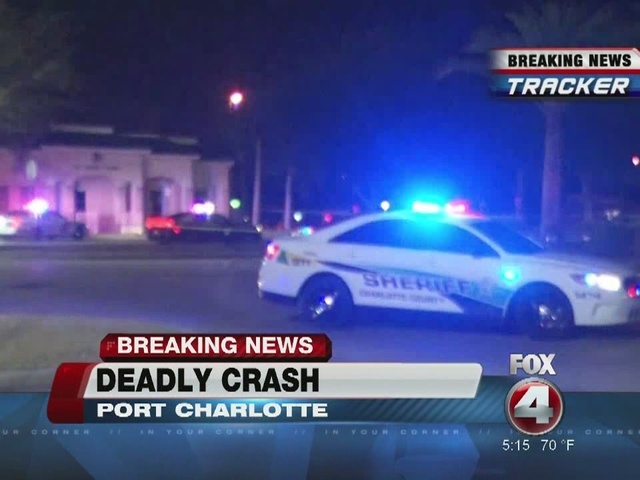 The driver, 21-year-old Wesley Chery, and 21-year-old passenger Brittany Beni, both of Port Charlotte, died in the crash. The northbound lanes of Tamiami Trail had been closed overnight, but all lanes are back open now. FHP says alcohol tests are pending in the investigation. Chery was arrested in Punta Gorda in October on a DUI charge, and also in Port Charlotte in January on several drug possession charges.